← June 28 Saturday Science Stumper! This year marks the return of July 4 fireworks to the East River, and the show promises to be fantastic! But this event draws a greater than usual glut of recreational boats to our waterway, many of which are not operated as carefully as we paddlers and rowers would like. It looks like the best, safest viewing area for paddlers and rowers from the north might be just south of the Williamsburg Bridge, on the Brooklyn side. 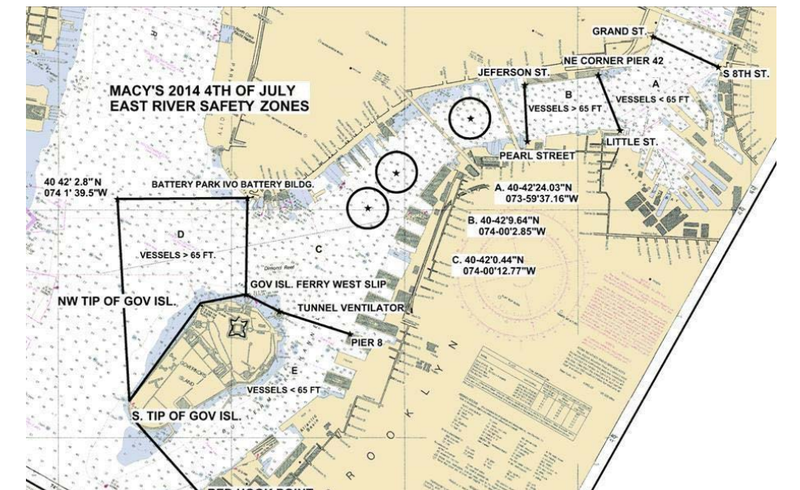 Please note that in East River marine radio chatter (Channel 13), the “north” and “south” referred to in this safety notice from the USCG are usually replaced by “east” and “west” because the waterway terminates by bending west into the Upper Bay and east into the Long Island Sound. No doubt paddling and rowing organizations will abide by best practices, but this post is especially directed to individual paddlers who might wish to enjoy this exciting night afloat.